THERE was a huge wrinkle in the Bulls' official lineup Wednesday night, when two of their starting guards were missing in action once again due various aching body parts. But when the NBA's best team record-wise shot lights out against the host Atlanta Hawks, having no Derrick Rose (strained groin) and no Rip Hamilton (bum shoulder) turned out to be just a minor inconvenience, not a major debacle. The Bulls had a sluggish start, trailing 21-23 at the end of the first quarter, but Luol Deng, John Lucas and Kyle Korver caught fire in the second quarter and drilled a combined five 3-pointers that fueled a 33-19 run. And just like that, in a dizzying barrage of swished 3s, the Bulls turned their small deficit into a big 54-42 halftime lead. 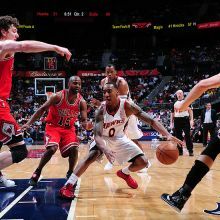 The Hawks valiantly crawled to within 54-60 at the 6:48 mark of the third quarter, but the Bulls hit the gas once more to run away with a 98-77 triumph at the Philips Arena in Atlanta. At 41-11, the Bulls kept the NBA's best record overall. The Oklahoma City Thunder, the thorughbreds of the West, are No.2 overall with a 38-12 slate while Chicago's bitter rival Miami Heat is at No.3 with a 35-13 won-lost slate. The Bulls orchestrated a balanced attack with five players scoring in double figures. Luol Deng led the charge with 22 points, shooting 8-of-14 field goals including 5-of-8 beyond the arc. Carlos Boozer had 20, Taj Gibson logged 19 while Joakim Noah and John Lucas had 10 apiece. "We played great," Deng told the Chicago Tribune. "Guys got easy looks because of the good ball movement." That good ball movement resulted in 26 Bulls assists, six more than Atlanta. The Bulls also pounded the boards, 45-36, and they took better care of the ball with just 7 turnovers against the Hawks' 11. The Hawks, who fell to 30-22 and 6th overall in the East standings, got 19 from Josh Smith and 13 from sophomore point guard Jeff Teague. But the rest of Atlanta's offense sputtered as the team shot just 32 of 80 field goals and 5 of 17 treys. With 14 games left in the shortened regular season, the Bulls head home Friday to the United Center where they host the Detroit Pistons.